Welcome! If you are here, you must have some questions about what is expected in Mr. K's classroom. Work safely. Always wear appropriate safety gear. Do not endanger yourself or others in the classroom. Come to class. Come mentally and physically ready to learn. (Bring your curiosity, your books, and pen, pencil and paper). Every day. Chemistry students need a scientific calculator every day. Be courteous. Use your manners. Listen when the teacher or other students are talking. Try your hardest. New things are seldom easy. If you do these things you'll have a great year and have fun learning a lot of science. Tests: Regular tests will count as 3 grades. In chemistry the Organic Unit final counts as 5 grades. Class work / homework: regular class work or homework assignments will count as 1 grade. 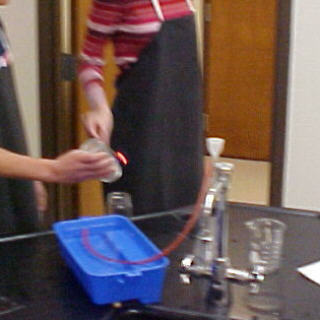 Lab experiences: Lab assignments count as 2 grades. Extra Credit assignments will be be available from time to time but are not a substitute for doing required work.